Yesterday I had a new commenter who I must have hit a nerve with one of my posts. Some of you probably know what I’m talking about. He or she comments IN ALL CAPS, says their keyboard is stuck but I don’t believe it. This person proceeded to comment all day, saying pretty much the same thing over and over. The comments were poorly written and made little sense. He or she implied that I was stupid because I didn’t understand what they were saying. I doubt anyone else did, though. Now I’m a pretty tolerant person, and usually allow comments that don’t agree with my posts, even to the point where the comments become trollish. I find it hard to say “NO” and not approve or delete comments that constitute as troll posts or spam. Setting good boundaries has always been a problem for me. But at this point, I feel like this site is being violated, and these continuous unreadable comments are flooding my inbox and this blog. For awhile I stopped replying or “Liking” these nonstop comments but continued to approve them (“don’t feed the trolls”), but that didn’t stop them from coming. Whoever this is seems to be on some sort of crusade–for what, I’m not sure. It doesn’t matter. I had about eight more of these comments waiting for me this morning. Finally I replied saying that if they continued I was going to have to delete them, because they are distracting to the main content of this board and could run off my regular readers. I apologize to the rest of my visitors who may have been put off by this spammer or afraid to comment themselves. I need to work on setting firmer boundaries, and I’m starting right here, right now. NO MORE OF THESE ALL CAPS SPAM COMMENTS will be approved. 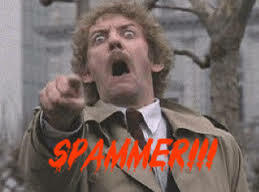 To you, SPAMMER, go spew your badly written vitriol somewhere else. This entry was posted in boundary violations, spammers, trolls and tagged Blogging, boundary violations, comments and replies, setting boundaries, spammers, trolls by luckyotter. Bookmark the permalink. Agree, what a pain. Lucky my spam catcher stops the majority of them and I can trash in bulk! I finally set my anti-spam to automatically delete spam because of the volume I was starting to get. Some of it still gets through though, and I have to manually delete those. The spam I usually get is someone trying to sell me weight loss products (is there a message here?) or someone advising that I need a new website design or something written in Chinese? Those kinds of spam go straight into my spam folder and I don’t even see most of them anymore since I have my spam automatically deleted now. Akismet wouldn’t recognize trollish, repetive comments as spam though, but I’m marking them as spam! Hey! Sorry, just wondering but do you manually approve each and every comment? I have it set to, I think 2 comments, after that I no longer have to approve them. Well done for stepping in and protecting your boundaries! It’s very difficult, but I think you made a good decision. I hope you’ll no longer have to deal with these kind of things. Well, as a blogger I’m sure from time to time I’ll run into problems again. It’s a hazard of the trade. But I’m getting better at knowing where to draw my boundaries and being firm and enforcing the rules when I have to. I have a policy to just say “NO” to Spam. It tastes disgusting and I don’t think it’s really made out of meat. I gotta admit, I used to like Spam. (hides). It taste good but it looks like dog food and is bad for you too. That’s just an urban legend that Spam is made of human meat…right? Amen, and what more could you have possibly done. Oh my goodness… I just clicked back to your book review post about Confessions of a Sociopath and I got dizzy just scrolling through all those screaming comments. I think you handled that guy very well… you were cordial, you gave him the benefit of the doubt, and you knew when to draw the line. Well done! I dated a guy whose emails were like that. Diagnosed high functioning autistic as a child, he was brilliant, fascinating, and very HOT. But early in our relationship he told me that he did not know how to love and that he had no soul. I didn’t believe him. I was a fool. Yeah, lol, you probably noticed I just let him rant but started not replying after awhile, but enough is enough! Your guy friend might have been a narcissist, hard to say but I think some people with self-diagnosed “high functioning autism” are actually covert narcissists. Not all, but some. I think you are right. Although he told me he had been diagnosed with autism as a child. Still, that could have been a lie. Which reminds me, he told me at the end of our turbulent year long relationship, that he had been as honest with me as he could be. Hmmm… that sounds very N, doesn’t it? It does. If he didn’t have an official autism/Aspergers dx, that might have been what you were dealing with. I am so thankful I broke my pattern of unhealthy relationships, even if it did take me to age 50 to finally wise up. Sigh… I have to get off of here now and pack my car, I am leaving on a 550 mile round trip drive all by myself, I will be driving through Albuquerque’s crazy traffic and I am nervous!! I’m going to visit my daughter, otherwise I wouldn’t do this. I just wrote a post about it on my new blog. Please say a prayer for me. Thanks!! Be careful! I will say a prayer for your safe trip! Is your daughter ok, I hope? My daughter is ok except for a possible sinus infection. I really appreciate your prayers. The drive was long and a bit scary, but I got here and so did she. We plan to go sightseeing tomorrow, to a nearby volcano field called El Malpais, which is Spanish for “badlands.” The ancient lava flow covers more than 114,000 acres! It looks like another world! We may do some hiking but not a lot, because this area is 6,488 ft elevation and my daughter isn’t used to it. Yay, I’m glad you got there okay! Well, I just “liked” his apology. Didn’t really notice when it was posted, though. Clearly the man has a lot of anger and was venting on you which, let’s face it, we all have to do sometimes. Also looked like he may not have very many outlets to let off his steam. Wonder why? I hope his apology was sincere and that it came timely to you. We all have our boundaries, which I think are a requirement to maintain sanity, and are free to close them whenever we feel the need, as you did.